I’ve long maintained that the eruptions that occurred in the final days of 2017 into January 2018, or Dey Mah protests, are by no means over. In the year that has elapsed since, the protest movements by the dispossessed continue to manifest in diverse yet interrelated collectives. Teachers, truck drivers, students, pensioners, and shop keepers, are simply some of the lower strata of the society that have displayed their collective dissatisfaction on the streets over the past year. Labour strikes of Haft Tapeh Workers’ Syndicate and the steel workers of Foolad Ahvaz National Group, have further turned southwestern Iran into a hotbed of progressive political struggle by the working class. The protests that continue to sprawl in response to a range of governmental deficits, from public backlash to fluctuations in currency, to country-wide sit ins by teachers voicing their dire working conditions and poverty, to a multitude of labour strikes, point to a rupture in the relationship between the regime and the general public. It is my contention that the outburst of the dispossessed and the poor of the periphery that erupted last year had been brewing for years and will continue for the foreseeable future in various forms of collective dissent from strikes and sit ins, to street protests and mass demonstrations. In the piece before you my intention is to compare the working class roots of this movement to the class composition of the two ruling political factions of Iran: Hardliners and the Reformers. I then build on the insight that understanding this irreparable conflict provides to offer an analysis of the resistance movement of the laboring classes that has surfaced since, and which holds much promise in terms of a political alternative. Finally, I will analytically discuss a set of necessary organizational conditions that must arise in order for the resistance to move forward and for mobilization of the masses to be realized. They are not so much of a prescriptive blueprint as they are a descriptive set of necessary conditions and hindrances. Studying the protest movements that occurred in 2018 is particularly important in that they have raised the general political consciousness of the citizenry, and the clash or the rift between the classes is brought to the fore yet again to be discussed, dissected and hopefully destroyed. In other words, the movement of the dispossessed that began last year, that continues to morph in different dissenting directions, and whose spirit can be observed in multitudes of protests that occurred since, has gifted a new life to the “class” argument, as if to embolden the socialist-communist in us. The social capital gained via labour strikes of the last year and the raised political consciousness of the nation are particularly important to the radical Left, for they must seize this opportunity to formulate a viable political alternative with the least amount of violence and human casualty which often plagues this political affiliation. Finally, while some scholars and analysts have pointed out the leaderless and unorganized feature of these protests in order to render them insignificant, I will argue not only for their power to disrupt the accepted political norms but for the role they played in producing an alternative and giving rise to potential leaders of the future. In January 2018 I wrote “despite having no leader and no collectively agreed upon mandate, the protests managed to shift the political frame from Hardliner or Reformer and move on to a third alternative: neither” (p. 194). A year later we have a clear alternative organically produced by the labourers of Haft Tapeh: management by workers councils. A point I will return to later in the text. To begin, I must reiterate this movement from below was the movement of the disposed, the poor and the working class of the margins, far from the sprawling urban centers. Although the United States’ withdrawal from the JCPOA in June of 2018 has essentially reshaped the country’s class formation overnight by forcing the lower echelons of the middle class to assume a meager blue-collar existence, this movement has its roots and its grievances in the lower classes. The proverbial “working classes” or the dispossessed, as I prefer to call them, are by no means a homogeneous and class-conscious group of the citizenry, on the contrary, they are fragmented and stratified. They include working workers, unemployed workers, peasantry, tribal remains and the poor. I also need to make yet another distinction in that Dey Mah was not a working class movement in the classic and class-conscious sense of the expression, but it was a “mass” movement of the dispossessed, and in that sense, it must be distinguished from what ensued later in the year such as Haft Tapeh. This, too, I will return to later in the text. The role of the dispossessed in the reproduction of post revolutionary Iranian society, has been largely overlooked. Partly due to their noticeable absence from the recent political uprising such as the Green Movement. However, this absence is being corrected on the ground in Iran itself as this disparate collection of dispossessed speak in their own voices of their own grievances to the powerful Islamic elites controlling the state. The 2009 Green Movement did not articulate the economic and political aspirations of the working class and Iranian peasantry, it assumed its interests were identical with the latter and that their task was to identify with its vision of a nationally unified and secular Iran. That partially explains why the working class abandoned the movement. On the other hand, the middle classes, particularly in the upper echelons, have been noticeably absent both in Dey Mah protests as well as from significant labour movements that have occurred since. Case in point: Foolad Ahvaz workers marched in Ahvaz city centers, a densely populated and industrial provincial capital, for over 35 days in large numbers yet their plight was continuously ignored by the rest of the citizenry. Therefore, this is a significant development since most major uprisings in modern Iran including the more recent Green Movement and the 1979 Revolution, had been largely led by the desires of the country’s urban middle classes. The Dey Mah revolts were the first independent protest by the dispossessed against the government, a government that has promoted itself as existing to materially better their collective lot since they were its source of political legitimacy. Promises that have proven false in the four decades the Islamic regime has ruled. The Islamic Republic, by all accounts, has been suffering from a crisis of legitimacy for over two decades when the official narrative of the state was challenged by the birth of the Reform movement, which proved to be a political dead end in terms of ushering in democracy. Since the beginning of this most recent cycle of protests in Iran, I have argued that the collective surge of the lower classes is far more concerning for the regime than the Green Movement ever had the potential to be. The Islamic regime has branded itself the “Republic of the Dispossessed” or “Dolat e Mostaz’afan” and managed to establish and legitimize its hegemonic political narrative on that basis, suppress dissent and reign (nearly) unopposed for decades. Loss of legitimacy in the eyes of its base of support in the working class is therefore no small fete in that ideological regimes are deeply dependent on their base in justifying suppressing dissent. The new wave of conflict and opposition to the regime, historically of political nature and thus rooted in the middle classes, is now originating from within the taken for granted laboring classes, the workers and the destitute of the margins of forgotten regions and the periphery. In other words, for the Islamic regime to survive domestically, and to uphold the appearance of legitimacy globally, it is reliant on the explicit support of its claimed base: Mostaz’afan. Such is the measure of the relationship between a theocracy and its ideological base. Put simply, the IRI is slowly but surely losing its legitimacy and ideological grip on the lower echelons of the society, a measure that can prove fatal for the regime. Let me break this down further from a double lens of class-factional politics. The gap between the two factions of the regime on one side and the public continues to widen. In 2018 the protesters quickly realized the political roots of their grievances, realizing the rulers, Hardliners or Reformers, were unsuited to be such and implied that their political authority should be superseded by an alternative political administration. This evolution in the collective consciousness of the rioting public of Dey Mah is also captured in the popular slogan “Hardliners! Reformers! The game is over!”. The Hardliners who are considered the ruling elite of Iranian politics, are in the habit of coopting the issues of “Mostaz’afan” and the working class not only for the purpose of ideological legitimacy, but also for their own political gain over the Reformers whom they render as frivolous and pro-Western liberalism. The Reformers on the other hand largely represent the aspirations of the middle classes whom tend to be more political: desire for democracy, freedom of expression, women’s issues, rights of minorities and so on. Therefore, it is by no coincidence that despite normalizing devastating neoliberal economic policies such as privatization of services formerly provided by the state (health, education etc. ), the Reform faction continues to harp on democratic rights and civil society notions to gain popular support. Nevertheless, such notions as opening up of the political sphere, transparency and realization of more individual rights, which Reformers tend to advocate come election time, have largely remained abstract and have failed to materialize over the past two decades since the Reform was formed. I make this assertion while acknowledging the fact that periods where Reform figures occupy the office of presidency are often accompanied by more relaxed enforcement of ideological mandates such as morality policing and so on. However, in the past two decades no tangible, concrete and real changes have been made to the laws of the land when it comes to the democratic aspirations of the people, and the constitution remains as divisive and prejudiced against women, minorities, intellectuals, ethnic groups and others. We must also keep in mind that the Iranian labour forces are not homogeneous and unified. Those employed by public organizations particularly in the oil and gas fields (i.e. Meli Naft, Melli Hafari, Meli Gaz) far much better materially and in terms of job prospects and security than their private sector counterparts. Not coincidentally, those industries are the main sources of revenue for the public coffer or Beit ol Mal. We must distinguish between these strata that seemingly belongs to the working class but exhibits more middle class tendencies in that they are inclined interested in maintaining the status quo of the Islamic regime. Moreover, while the Hardliners, whom have their roots in the new Iranian bourgeoisie, ironically stand on the shoulders of the working classes to advance their political agenda, the Reformers largely exploit the middle classes whose attempts to regain the loss of their political rights post 1979 have gone unanswered. Following the 1979 revolution and particularly post war, a new bourgeoisie emerged largely represented by the clerics embedded in the establishment, lay figures loyal to the regime, and high ranking members of the IRGC and the Basij militia. This is generally the class positioning of the ruling Hardliners. While similar to Hardliners in terms of class positioning, the Reformers are those regime insiders that were sidelined in the factional politics and powerplays of the Islamic Republic, thus despite posing as the opposition history has shown they are chiefly concerned with regaining their loss of political and economic power. More precisely the Hardliners dominate the larger share of the oil and gas revenues, and that is the primary source of contention between the two factions of the government. Therein lies the answer to both factions’ efforts to reduce the scattered yet interrelated political outbursts of the working classes from Dey Mah protests to Haft Tapeh and Foolad Ahvaz strikes to simply “trade disputes”. In reality, these interdependent protest actions have every potential to overthrow the Islamic regime and present themselves as a solid alternative, a point I will discuss later in the document. Despite paying lip service to the cause of the labouring strata and the dispossessed, neither Hardliners nor Reformers could logically defend them, because quit obviously they need to continue exploiting this class of the citizenry in order to maintain their dominance. Needless to say, what the protesters want, i.e. social justice, stands in stark contrast to the elite’s own class interests. Quit simply put, this is a classic manifestation of the political elite routed in the upper classes ensuring their own survival. Reformers are committed advocates of neoliberalism and all that in ensues including privatization, economic instability of the lower strata and precarious employment, conditions that partially brought about the revolts. Reformers, their relatives (and I do mean relatives) and allies over the years, have built their corrupt empire on economic structures that are increasingly neoliberal and are to blame for giving rise to the current crisis. At the same time such policies provide them with cheap labor and unrestricted access to financial and other resources hence creating or otherwise intensifying the economic, social and environmental crises we currently deal with. Grossly underselling public assets such as the Haft Tapeh Sugarcane Factory to private entities (in essence privatizing) with funds borrowed from the public coffer to owners who will then dismantle the organization and leave thousands without jobs is a clear example of such policies. It becomes clear then why Reformers would not only condemn the Dey Mah protests but abandon working class protests of all stripes. The hardliners on the other hand insist on maintaining The status quo thus intolerant of dissent in any shape or form. Despite professing to rule on behalf of “Mostaz’afan”, their main interest is preserving their undisputed power and dominance over the oil and gas revenues and the political process while asserting their hegemonic ideology on their base. I have long maintained that the nature of protests in Iran are cyclical dating as far back as the Constitutional Revolution at the turn of the 20th century. From the Constitutional Revolution in 1905 to the Green Movement of 2009, one can’t help but recognize that the Iranian people’s demands for justice, freedom, and democracy continue to surface, reminding us that despite the heavy costs paid so far by this nation, those demands remain unfulfilled as of yet. The desire for a free and just society, and for emancipation continues to return in generation after generation of Iranian people, which explains the cycles of protests, large-scale demonstrations, and revolutions every few decades (p. 21). While it is out of the scope of this article to delve deeply into that argument, I will say that critical to our understanding of Dey Mah protests is a clear conception of the legacy of revolutions and protest movements that come prior to it including the Green Movement and 1979 revolution. In other words, the cycle of protests that ensued last year and which continues to materialize in different manners of political dissent, is the outward manifestation of over a century of unfulfilled demands for social justice and emancipation. The stark difference between Dey Mah and majority of movements that came before it is Dey Mah’s roots in the lower classes. While the political reality of modern Iran is fluid and uncertain, one can be confident such demands as Bread-Work-Freedom will not be fulfilled in a system that is increasingly oriented to neoliberalism. Additionally, these cycles of protest and dissent will continue to manifest for as long as the as aspirations of the people are not met; case in point: Dey Mah continues to live in Haft Tapeh, Foolad Ahvaz and others. Nevertheless, I am aware of the argument made by some of my colleagues in the field that Dey Mah is over and irrelevant to the labour strikes we are witnessing since. The argument is the 2018 revolts were different both in terms of the format and content (i.e. participants). The format of Dey May protests was largely street riots instead of labour strikes and sit ins, and participants where masses of the poor and marginalized and not necessarily labouring classes in their capacity as such. Yet, while I conquer with the dissimilarities between the two in terms of format and content, as I detailed above, my contention is they both have their roots in the same “class” of people. I am using “class” here in the Marxist sense of the word and not the sociological stratification. Therefore, from a Marxist classification point of view, Dey Mah and the labour unrest that ensued in the year since are continuation of the same class struggle, for the movements prior to them were largely rooted in the middle classes. Ultimately, Dey Mah will not be over and will continue to evolve and return to haunt the rulers of the land for as long as the demands of the people continue to go unanswered. The obvious question for many not only in Iran but across the globe now is whether the regime is on the verge of collapse? My analysis indicates at this point in time the Iranian regime is very much in control though multitude of crisis are quickly mounting and painting the regime into a corner. Regardless, this is a regime that has proven itself highly adaptable to both foreign and domestic pressures over the past four decades. The Islamic regime is in possession of many material means to elicit co-optation from a collection of social classes. One only needs to review the privatization trend of public assets in the past decade to see they are conducted with the aim of building alliances and buying the loyalty of would be factional competitors. Additionally, the IRI is a highly repressive authoritarian system in possession of sophisticated apparatus of coercion as well as multiple security and intelligence services, censorship and propaganda arms. Finally, the regime also has in its extensive arsenal of weaponry against the lower classes: The Reformers (whom it has erected at times of crises), alliances with Russia and China, and close ties to Europe and let’s not forget the World Bank in its effort to implement neoliberalism. Consequently, as the ruling elite in Tehran are quickly running out of less costly options such as cooptation and temporary dispersion of revolts, it is highly likely that the regime would engage in widespread and violent crack down on its opposition to ensure its continued survival, for it has both the capability and the motivation to do so. What further emboldens the political elite to undertake massive clamp downs despite the foreign and domestic costs, is the absence of a cohesive and united opposition within the Iranian borders or brewing in the Diaspora. The question remains however what is the Left’s course of action in this turbulent climate in the life of modern Iran? I will discuss that next. cultivating an alternative. In what follows I will describe a set of conditions that must be present in order for the resistance movement of the dispossessed to continue and for the struggle to prevail. I’m of the opinion that without these basic pre-conditions the resistance movement of the dispossessed will be hindered. They include three distinct yet interdependent concepts: building solidarity, organizing, and cultivating an alternative. The Left must commit to building solidarity both vertically between classes as well as horizontally amongst various dissenting groups. I will explain this point in more detail in what follows: First and foremost, the Left is tasked with aligning the various strata of the working class and the lower echelons of the middle classes whose class, social and political interests tend to be more convergent. Generally speaking, the upper middle classes in Iran tend to be more conservative, aligned with the regime and in favour of retaining the status quo. As I detailed above, the working classes in Iran are not a homogeneous strata and attention must be paid to the disparity in the plight of those employed in the private sector such as Hepco in the city of Arak and those in the public strongholds of oil and gas. Aligning the above strata includes raising awareness regarding the dangerous and downright irresponsible call of the middle classes for political systems of the neoliberal kind, since those too will continue to benefit primarily an elite vis a vis the rest of the nation. In other words, awareness must be raised, one way or another, that a policy embrace of neoliberalism will have severe consequences for the working class as well as the middle class in Iran. I would add that while it is true the middle classes might not consciously call for such political systems, advocating for many opposition groups preoccupied with changing merely the political system, i.e. the “regime change” camp, and not an entire class overhaul, is essentially embracing neoliberalism, albeit indirectly. In essence, this struggle against the Islamic regime is no longer a universal narrative but rather a constellation of a plurality of forces and diversity of interests in negotiation and contention with the government: the middle class with their political grievances, the dispossessed in their struggle to ease material pressures, and women and minorities standing up for equal rights, to name a few (p.192). My observations indicate that while the agitation of the marginalized, the poor and the taken for granted has soured in the year that has elapsed, the struggles of women, human rights activists, minorities, and other groups have subsided and overshadowed. Naturally, in times of economic turmoil, rights activism tends to take a backseat to more pressing economic concerns. However, in order for the struggle to move forward, and be able to face a regime as repressive as that of the IRI we clearly need to unite. Second distinct yet interdependent step the Iranian Left must focus on in order to survive the battle is the basic need to organize. I am aware of the difficulties of organizing under such repressive conditions, nevertheless in the absence of an organized and concrete opposition the regime will continue to dismantle even the most progressive manifestations of opposition. In other words, in the absence of organization the regime will continue to crack down and dismantle any and all collective dissent similar to mass arrests, imprisonment and torture it unleashed on Haft Tapeh and Foolad Ahvaz labour leaders. In this manner we will continue to lose the political steam that has gathered and the diverse groups that have mobilized since Dey Mah along with any leaders and talent they may have produced. While these strong yet scattered movements have every potential to threaten the very foundations of this regime, in confronting a violently repressive system that has ruled with an iron fist for four decades, we in the Left must strive to do a far more superior job at organizing or risk eradication yet again. In this I conquer with my colleagues in the field that such organization must be linked nationwide. The Left must take leadership of this movement! However, we first desperately need to theorize and strategize a practical political alternative aligned with the current realities of modern Iran and its global context. One such promising alternative was presented by the Haft Tapeh Workers Syndicate during their ongoing labour struggle. As I have argued previously1, management by workers councils put forth by Haft Tapeh is ruling from below: a grassroots, organic authority formed on the ground with every potential to expand into a full fledged political alternative. This alternative, contrary to almost all others, save Reform, is the only homegrown solution currently at our disposal to ensure the interests of the working class as well as the middle classes. Let us not forget while the Reform movement has lost significant legitimacy and appeal since last years’ protests, yet in the absence of an organized and cohesive opposition they continue to present themselves as the only low-cost political alternative within Iranian borders. Therefore, every effort must be spent to break the hegemonic grip the Reformers have long exhorted over any radical potential in the nation. Thus, we are in need of sound theoretical approaches developed by scholars and intellectuals particularly those with radical Left orientation which can then be executed by political activists and organizations. To that effect we need to challenge the Reform intellectuals particularly those active in the system to expose the fundamental contradictions of their philosophical and theoretical assumptions. We must engage them publicly in order to disprove their discourse and its embedded distortions and oppressive nature. This is yet another reason why engaging in discourse is critical moving forward. In order to accomplish the above task, the Iranian Left must reinvent itself and its language. We are required to theorize and speak the 21st century language of Robotics, Artificial Intelligence, Cybernetics, as well as Globalization and neoliberal market economy; all emergent and concrete realities of modern Iran which did not exist in 1979. We must shake off the shadows of intellectuals and theories past, the late Jazani’s and Soltanpour’s, and re-theorize this embattled movement while building on their legacy. Additionally, I would argue that one of the key reasons the Left has not been able to challenge the hegemony of Reform is due to the fact that the memories of the betrayals of Hezb e Tudeh and Fadayian-Aksariat during the revolution are very much alive in the collective conscious of the public. We continue to lose the bulk of the progressive youth potential to the distortion that is the Reform doctrine, partly (and I reiterate “partly”) because they blame the Left, the National Front and Freedom Movement (Nehzat Azadi) for ushering in this regime, and I have to admit they are not entirely wrong. Hence there is a dire need for the Iranian Left to reinvent itself and to break the hegemony of Reform if we are to pose as a credible alternative. Without a robust opposition and strongly theorized and strategized political alternative, Reformers will continue to be in possession of the bulk of the “oppositional” potential and thus sway considerable political influence such as they have done so far. Therefore, the socialist-communist forces must make it a priority to unfailingly chip away at the Reform’s legitimacy at a time in their political life cycle when they are most vulnerable to prevent them from regrouping before the next election cycle. 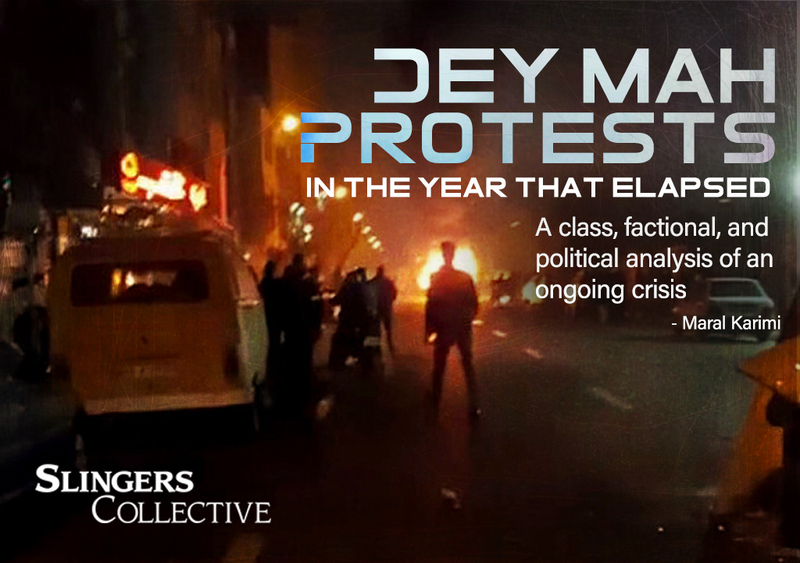 In this piece I have attempted to provide an overview of the Dey Mah protests in the year that has passed in terms of the class composition of the protesters, the opposing social actors (i.e., the political establishment and its factions). My aim here was to also describe a critical set of pre-conditions that are necessary in order for the struggle to move forward. I believe Dey Mah was the movement of the dispossessed and that it continues to manifest in multitude of protest acts since. This agitation by the working classes poses a real threat to the survival of the regime at least in its current form and thus must be studied carefully from different angles. Without sounding like a broken record, I must reiterate the role of education and enlightenment not in the traditional sense of the concept but in working on the ground and sowing the seeds of political awareness and ultimately the emancipating socialist values, which is not an easy fete. The Left particularly needs to focus on democratic principles, social justice issues, gender, ethnic, sexual orientation, religious equality as well as environmental issues and economic expansion. I will end this piece by admitting I am aware of the abstract notion of the descriptive pre-conditions that I put forth here, however as a social scientist that is the nature of my vocation: to analyze socio-political phenomena and provide theoretical alternatives. I’m a firm believer in crossing academic lines into political activism with two caveats: with the acute awareness of one’s class location, roots and strengths, and when time is ripe. Now is the time for both sides to engage in collaborative discourse, for none can survive without the other. Strategizing and practical implications of scholarly analysis are the prevue of those with training and experience in political activism, both of which many of us scholars lack. Thus, I will leave this in their capable hands to do with it what they will. 1Karimi, M. (2018). The Iranian green movement of 2009: Reverberating echoes of resistance. Lanham, MD: Lexington Books, Rowman & Littlefield Publishing Group. 2Rahnema, S. (2019, January 1). نزدیکی و دوریِ جریانات سیاسی تابعی از جنبش‌های مردمی است. 3Karimi, M. (2018). The Iranian green movement of 2009: Reverberating echoes of resistance. Lanham, MD: Lexington Books, Rowman & Littlefield Publishing Group. 4In general, what is currently haunting the Islamic regime and is potential cause for anguish for any ruling political administration in future Iran, be that regime Islamic, neoliberal, socialist or liberal-democrat: the surplus labour population of modern Iranian society is large in size and young in age. What is to become of their collective lot when Iran joins global financial markets and its business owners avail themselves of cheaper means of producing much of the material products need for domestic and regional consumption via robotic and artificial intelligence technologies? Robotic and artificial intelligence technologies as the holy grail of neoliberal economics because of their minimal need for human labour power to function which translates into few if any workers and no trades unions to interfere with the rational pursuit of private economic self interests. Currently Iran’s isolation and its adversarial relationship with the United States, the leader of the neoliberal world market economy, has prevented it from joining global capital markets. Neoliberalism, as we know, is the economic arm of American hegemony. However, should that dynamic change either vis a vis a regime change or simply a fundamental shift in IRI’s core policies, and should such technologies be introduced into Iran, this would mean mass economic death to large numbers of workers, theoretically, even more than the current numbers of unemployed. 5Kalantari, A. (2019, January 3). تشکیل یک کنفدراسیون سراسری از سندیکاهای مستقل یک اولویت است. 6 Karimi, M. (2018, December 11). Discourse of Radicalization: Haft Tapeh Sugarcane Workers’ Struggle and Birth of a Political Alternative.